This section describes the rules that the INBREED procedure uses to compute the covariance and inbreeding coefficients. Each computational rule is explained by an example referring to the fictitious population introduced in the section Getting Started: INBREED Procedure. 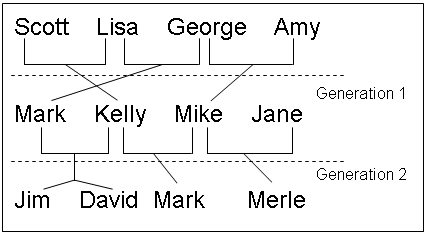 To calculate the inbreeding coefficient and the covariance coefficients, use the degree of relationship by descent between the two parents, which is called coancestry or kinship coefficient (Falconer and Mackay; 1996, p.85), or coefficient of parentage (Kempthorne; 1957, p.73). 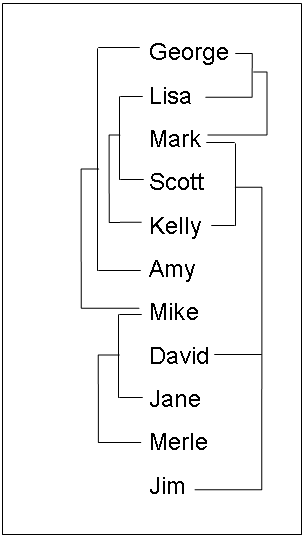 Denote the coancestry between individuals X and Y by . For information on how to calculate the coancestries among a population, see the section Calculation of Coancestry. where is the coancestry between X and Y. The covariance coefficient is sometimes called the coefficient of relationship or the theoretical correlation (Falconer and Mackay (1996, p.153); Crow and Kimura (1970, p.134)). If a covariance coefficient cannot be calculated from the individuals in the population, it is assigned to an initial value. The initial value is set to 0 if the INIT= option is not specified or to cov if INIT=cov. Therefore, the corresponding initial coancestry is set to 0 if the INIT= option is not specified or to cov if INIT=cov. The numerical values for some initial coancestries must be known in order to use these rule. Either the parents of the first generation have to be unrelated, with if the INIT= option is not specified in the PROC statement, or their coancestries must have an initial value of cov, where cov is set by the INIT= option. Then the subsequent coancestries among their progenies and the inbreeding coefficients of their progenies in the rest of the generations are calculated by using these initial values. Special rules need to be considered in the calculations of coancestries for the following cases. because ‘Jane’ is not an offspring in the population. Thus, the inbreeding coefficient for an offspring of ‘Mark’ and ‘Lisa’ is 0.34375. For a more detailed discussion on the calculation of coancestries, inbreeding coefficients, and covariance coefficients, refer to Falconer and Mackay (1996), Kempthorne (1957), and Crow and Kimura (1970).